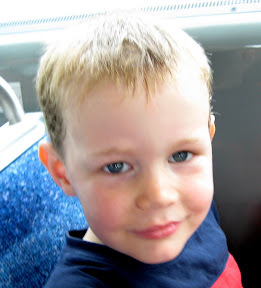 On the weekend while the Mama's were engaged in some car seat instruction BigE said he wanted to ride the bus to the train for an adventure. The WB Family decided it was a good idea and came along. 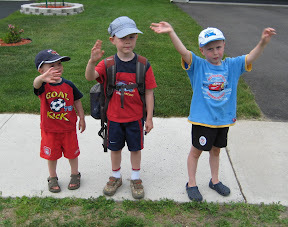 The lined up patiently waiting for the bus. BigE and his buddy Monkey were taking turns wearing the big backpack. Here we are riding in the back of the bus. Everybody had divided up the windows so everyone knew where they could look out. 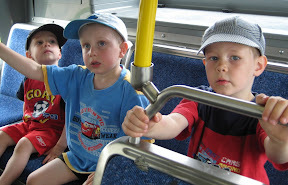 The bus takes us right to the start of the light rail train service. In 10 or so minutes you can go from south to just outside the downtown core. Best part, of course, is that you can turn right around and ride it back. It goes over a river, through a tunnel, and passes the other train. 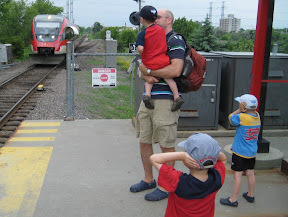 On the train we learned the important lesson from bigC "Don't drink the dirty water"
After returning to our original train stop we headed through WalMart for a few minor items and then caught the original bus back to the neighbourhood. I almost caught a very good shot here but it turned out a little blurry. 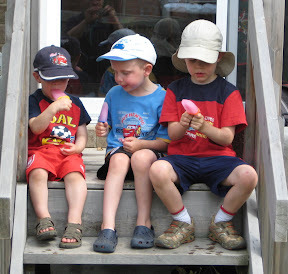 After we returned the kids relaxed with some lemonade Popsicles after all that hard work and excitement. Posted by PB at 8:02 a.m.